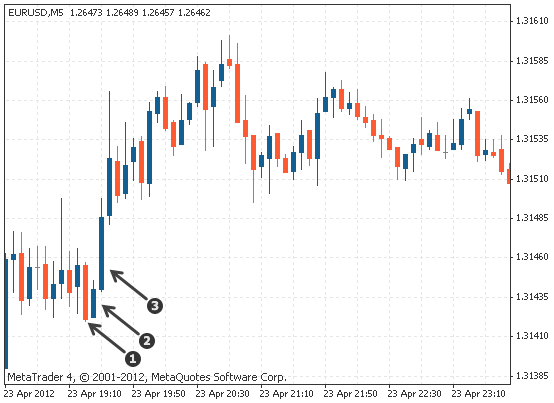 The three inside up pattern is similar to the morning star triple candlestick pattern – it indicates a potential trend reversal found at the end of a downtrend. The first candlestick is long and bearish, indicating that the market is still in a downtrend. The second candlestick is bullish and should ideally close at the halfway mark of the first candlestick. The third candlestick is also bullish and closes beyond the open of the first candlestick, ideally above the high of the second candle. The three inside down candlestick pattern is the opposite of the three inside up pattern and indicates a trend reversal found at the end of an uptrend. The first candlestick is long and bullish, indicating that the market is still in an uptrend. The second candlestick is bearish and should ideally close at the halfway mark of the first candlestick. The third candlestick is also bearish and closes beyond the open of the first candlestick, ideally below the low of the second candle. A reversal pattern signal is stronger if it happens after a steep trend because the markets can rarely sustain a rapid price movement; a correction can usually be expected. If the second candlestick does not reach the halfway point of the first candlestick, but the third still closes beyond the open or the low of the first candle, it may be considered as a valid three inside down pattern. the three inside up and three inside down are reversal patterns. the first candle is long in the direction of the trend. the second candle is shorter and closes up to the half way mark of the first candlestick, indicating there is a change in momentum. the third candle closes beyond the open of the first candlestick.